Kevin Ruane, Churchill and the Bomb in War and Cold War. Bloomsbury Academic, 2016, 424 pages, $34 (Amazon $24.73, Kindle $15.39). Although Winston Churchill is remembered for many admirable qualities, he is rarely described as a nuclear visionary. Yet he demonstrated that ability several times, not least in his remarkable essay, “Fifty Years Hence,” published fourteen years before scientists on the Manhattan Project detonated the first nuclear weapons. Over Christmas in 1931, hundreds of thousands of people read that essay, in which they learned that what he described as the “gigantic source of energy” storied in atomic nuclei might soon be released. “What is lacking is the match to set the [nuclear] bonfire alight,” he remarked. Scarcely two months later in Cambridge, England, the physicist James Chadwick discovered the match—the sub-atomic particle he called the neutron. In Churchill and the Bomb, a historian at Canterbury Christ Church University, gives us a comprehensive and well-written account of how Churchill handled the difficult politics of “The Bomb.” Ruane does not dwell on Churchill’s prescient nuclear journalism, but has chosen to focus on his involvement in developing the weapons, from early in World War II to his final departure from high office in 1955. In just those fifteen years, global nuclear politics took shape and Churchill played a more important role in it than many historians appear to recognise. Churchill had several attitudes to The Bomb, and they resist glib summarisation. However, it is reasonable to divide his involvement with the weapon broadly into three parts, as Ruane does here: Churchill was a bomb-maker during World War II, a threatening diplomatist during the early years of the Cold War, and a peacemaker in his final years as Prime Minister. Ruane traces the development of the British leader’s views roughly chronologically, drawing on an extremely wide range of archival sources, all of them referenced meticulously. A year after the end of the war, Churchill privately considered the possibility of the West’s making a pre-emptive nuclear strike on Moscow, his physician Charles Moran later recalled. Some commentators have dismissed this as an anomaly, but Ruane demonstrates in a revelatory chapter that Churchill often talked about making such a move, though only in private, and never as a recommended policy. 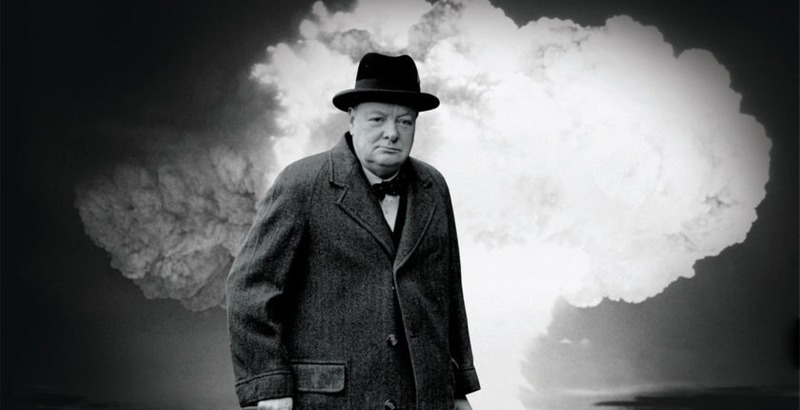 It was only in February 1950 that Churchill demonstrably began to change tack: “the atomic diplomatist exited the stage, leaving the nuclear peacemaker in the spotlight,” as Ruane puts it. Even then, Churchill did not entirely banish the thoughts of using The Bomb as means of coercion. During a Shadow Cabinet meeting in the following December, Churchill ended a soliloquy on The Bomb by imagining an ultimatum to Russia: “Either you agree to our terms…or we destroy you!” It remained, of course, imaginary. There are many valuable accounts of Churchill’s nuclear thinking during his second premiership, notably in books by Klaus Larres and Peter Hennessey. But, for me, the account Ruane gives here is outstanding for the breadth of its scholarship, the richness of its narrative and the acuity of its judgements. Among its highlights is Ruane’s description of Lindemann’s impatience with Churchill’s sometimes unpredictable view on The Bomb, which nearly led to the cancellation of the programme that the Attlee government had begun in secret. The British nuclear industry owes much more to Lindemann than most specialist commentators appear to know. Even more rewarding is Ruane’s account of Churchill’s realisation in early 1954 that the consequence of a thermonuclear war between the U.S. and Russia would be even more catastrophic than most people, including him, had appreciated. There is ample room for interpretation of his motives here. At one extreme, Churchill’s actions could be described as trying to elbow his way into the limelight one last time; at the other extreme, he can be portrayed as one of the pioneers of détente. Ruane offers us a balanced view of many different interpretations, leaving us with the view that Churchill was making a constructive attempt to avoid a nuclear catastrophe, which then looked very much in the cards. Thermonuclear warfare was the subject of Churchill’s last great Commons speech, which he gave on 1 March 1955. Ruane concludes his impressive book with a virtuoso account of the event, in which Churchill drew attention to the far-sighted comments that he made in 1931 on the possibility of nuclear weapons. To illustrate his sagacity, he could not resist quoting from his essay “Fifty Years Hence,” which most MPs had probably forgotten. It is perhaps surprising that the source of the colossal amount of energy typically released by the detonation of thermonuclear weapons, which shocked him a year before, was not new to him. He had mentioned it in his essay. Churchill was obsessed with the possibility of nuclear war long after he left office. He had not been especially successful in handling the politics of this new type of weapon, though it is not easy to think of any other 20th century leader who would have done it much better. For a politician who is often accused of having spent much of his time living in the past, it is striking that Churchill was at his most impressive in nuclear matters when he was looking to the future. Graham Farmelo, a biographer and science writer, is author of Churchill’s Bomb (2013). He is a By-Fellow at Churchill College, Cambridge, and Adjunct Professor of Physics at Northeastern University, Boston.